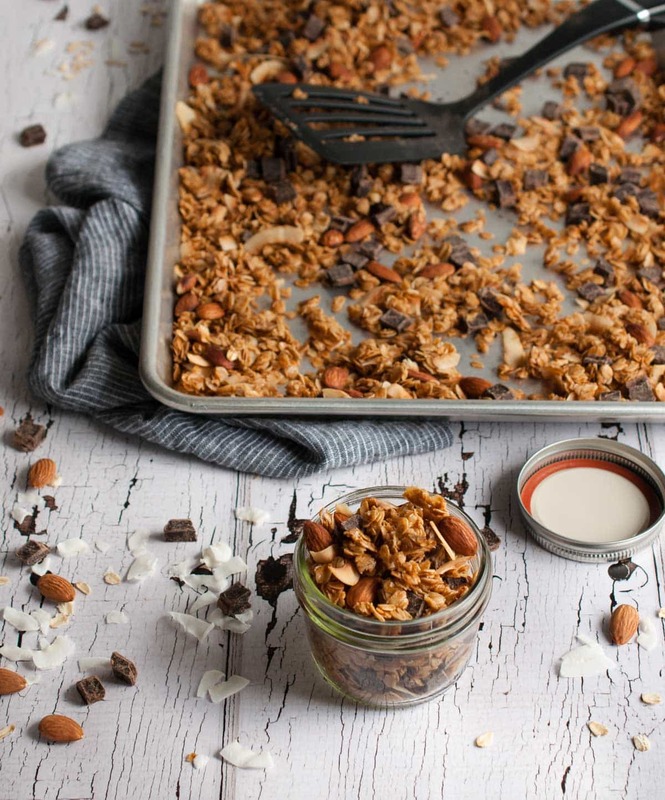 Crunchy chocolate coconut granola with toasty almonds, coconut oil, honey, and a dash of cinnamon to make your breakfast the best meal of the day. Granola is a love of mine that has blossomed throughout the years. Ten years ago, I was more take it or leave it. To be honest, more leave it than take it even. I couldn’t care less about crispy oats. Today, its a mandatory staple in my cupboard. I add a touch of granola to my morning yogurt, grab a handful as a snack, or tilt the jar directly into my mouth like a desperate granola fiend letting granola fall to floor all around me. Kind of like cookie monster but with granola. And as with anything, homemade usually trumps what you can buy off the shelf. I’ve got my go to basic granola recipe that I use all the time, but have been branching out and trying new versions lately. Now that I’ve gotten this one tweaked to perfection, I figured its time I share with you. Why this one first? Coconut. That’s why. I honestly don’t even care about the chocolate chunks too much. I do if I’m snacking on it, but if its in my yogurt, eh, I don’t really care. My husband on the other hand – chocolate obsessed. The chocolate made this recipe for him. I’m also one of those people that prefer chocolate chip cookies with minimal chocolate and maximum cookie though so take my preferences with a grain of salt. Weirdo alert. Anyways, he was having a meeting with his business partner/ friend in our dining room when I pulled a test batch of this chocolate coconut granola out of the oven. It got demolished in minutes. Like absolutely obliterated, barely a crumb left. Granted, I was just testing so it was a half batch, but damn boys! This granola is a popular one. Although you’ve got to pull it out and do some stirring, this really is a simple recipe. You mix it up in one container (ala the pic below) and in two simple steps. Blend the wet ingredients and seasonings, then add the oats. Stir, then spread out on a baking sheet. The tricky part is that you bake all of that separately, and then add in the nuts and coconut once the oats have already had a chance to roast up on their own. Not that tricky when I put it like that huh? Case in point, this is an EASY recipe. Making your own granola makes you seems like a culinary master, but its all for naught. It really seems to impress people though so let’s keep the easiness between us and keep impressing the hell out of anyone that runs across our homemade chocolate coconut granola. The ingredients are all items that I have on hand, but I also have a pretty extensive pantry of goodies. Some of you might not have coconut extract laying around, but its not too hard to find. You can either get a pure coconut extract or imitation. I’ve used both and although I tend to lean toward purity in ingredients, its really up to your personal preference. The coconut flakes on their own aren’t going to give this the coconutty flavor you want in a chocolate coconut granola, in my opinion. It needs a little help to up the coconut factor, which makes the extract 100% necessary. If the calories in this recipe scare you, don’t let them. When I’m not dumping granola into my face like a heathen, I really just add a touch to my yogurt, probably half a serving (about 1/4 cup). If you’re eating it with milk like a cereal, you’ll probably want that full serving, but you can leave the chocolate out if you want a more nutritious breakfast. Or if you are like me and like it just fine without it. Chocolate aside, the calories are full of nutritious oats, almonds, coconut, natural sugar from honey and fat from coconut oil. Yeah, its got sugary sweetness and carbs… but its granola. Its a sugary snack and there’s no way around it. That being said, your sweet snacks could be a lot worse so just keep the granola snacking in moderation and enjoy. These yogurt granola pics are basically a prettier version of my daily breakfast. Like with this yogurt parfait which really looks like a stirred up mush in a bowl not a fancy glass. Pretty or not, yogurt and granola are made to be combined, and luckily this chocolate coconut granola pairs well with pretty much any yogurt flavor you can find. Is anyone else out there super picky about their yogurt though? I really don’t like the super high sugar ones with 20 plus grams of sugar in a measly 6 oz. container. I mean I do like them if I’m going to be honest, but I try to steer clear since they’re pretty much like candy. The super tangy plain ones really don’t appeal to me either though. Or the chalky ones. Blah. If you’re with me on this and have good yogi recommendations, please share. We can be finicky yogurt eaters together and annoy our less picky spouses. Thoroughly mix honey, melted coconut oil, coconut extract, salt, and cinnamon. Add oats and stir to evenly coat with the liquid mixture. Spread oats out over a lined or greased baking sheet and bake for 15 mins. Remove from oven, add coconut and almonds and stir mixture. Bake for another 15 minutes then remove, stir, and bake for another 15 minutes. Remove from oven, stir, and let sit to cool. Once granola is mostly cool, stir in chocolate chips and store in an airtight container for up to two weeks. *To make recipe vegan, swap honey for agave syrup and chocolate for cocoa nibs. Hi there, I know of a fantastic yogurt called Seven Stars Farm yogurt. It is only sold in quarts and you can order online, if I’m not mistaken, or pick it up at the farm if you live nearby in PA. They also sell it in some grocery stores, but I’m not sure where you live. Anyway, it’s European style yogurt, they use no emulsifying agent, and it is pasteurized at the lowest possible temperature allowed by law instead of ultra pasteurized like most yogurt. Anyway, I’m done geeking out about yogurt haha Merry Christmas! Good to know! Yogurt is one of the only foods I’m this picky about. The texture of so many brands is just plain gross. I’m going to have to try Seven Stars soon – thanks for the recommendation! I freaking love coconut in granola. It gives it such a wonderful flavor that infuses everything. This version includes chocolate as well, therefore it’s even better!! Awesome.